Ebenezer Cobb Morley was born in Hull in 1831. He moved to London where he worked as a solicitor. He was a keen sportsman and established Barnes Football Club in 1858. Morley became captain of the club and in 1863 he wrote a letter to Bell's Life newspaper proposing a governing body for football. This letter resulted in a meeting taking place at the Freeman's Tavern in London in October, 1863. The clubs represented at the meeting included Barnes, Blackheath, Perceval House, Kensington School, the War Office, Crystal Palace, Forest (later known as the Wanderers), the Crusaders and No Names of Kilburn. Charterhouse also sent an observer to the meeting. The Football Association was established at this meeting. The aim of the FA was to establish a single unifying code for football. As Percy Young, has pointed out, that the FA was a group of men from the upper echelons of British society: "Men of prejudice, seeing themselves as patricians, heirs to the doctrine of leadership and so law-givers by at least semi-divine right." IX. A player shall be entitled to run with the ball towards his adversaries' goal if he makes a fair catch, or catches the ball on the first bound; but in case of a fair catch, if he makes his mark (to take a free kick) he shall not run. Some members objected to these two rules as they considered them to be "uncivilised". Others believed that charging, hacking and tripping were important ingredients of the game. One supporter of hacking argued that without it "you will do away with the courage and pluck of the game, and it will be bound to bring over a lot of Frenchmen who would beat you with a week's practice." The main defender of hacking was F. W. Campbell, the representative from Blackheath, who considered this aspect of the game was vital in developing "masculine toughness". Campbell added that "hacking is the true football" and he resigned from the FA when the vote went against him (13-4). He later helped to form the rival Rugby Football Union. On 8th December, 1863, the FA published the Laws of Football. 6. When a player has kicked the ball, any one of the same side who is nearer to the opponent's goal line is out of play, and may not touch the ball himself, nor in any way whatever prevent any other player from doing so, until he is in play; but no player is out of play when the ball is kicked off from behind the goal line. 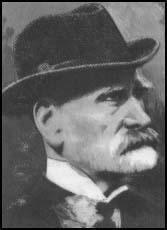 Ebenezer Cobb Morley held the post of secretary of the Football Association until 1866. He continued playing for Barnes and in 1866 he scored in the first representative match, between the clubs of London and Sheffield on 31st March 1866. The following year he was appointed as president of the FA. Morley also established the Barnes and Mortlake Regatta for which he was also secretary (1862-80). He served on the Surrey County Council for Barnes (1903-19) and was a Justice of the Peace. Ebenezer Cobb Morley died in 1924.